Good day, horror fans. Not much out there is scarier than seeing a giant sci-fi movie (Jupiter Ascending) and a giant fantasy movie (Seventh Son) getting their asses handed to them in the box office by SpongeBob SquarePants. Long live genre efforts! The only thing resembling horror hitting limited theaters and VOD this week is the dubstep-infused psychological thriller Enter the Dangerous Mind. Pop some molly and get on that. In smaller news, it’s been rumored that Nicolas Winding Refn’s The Neon Demon is a film about voodoo and cannibal supermodels, so yay! Oculus director Mike Flanagan’s next film Somnia will hit theaters on May 8th, and Image Entertainment acquired Joe Dante’s Burying the Ex for release this summer. Amanda Seyfried and Theo James signed on for the supernatural thriller Black Lung. 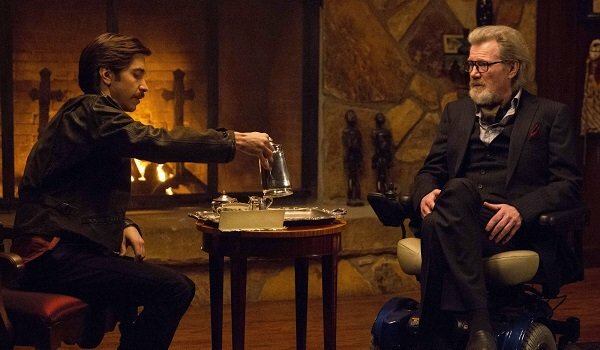 And The Guest’s Adam Wingard is reteaming with writer Simon Barrett for a "cabin in the woods" horror called The Woods. And now, a story with a twist! Despite the fact that his next movie, The Visit, doesn’t come out until the end of the summer, director M. Night Shyamalan is apparently already busy at work on his next feature. That’s probably the best way to save oneself from doing too much research into The Visit’s pre-buzz, which is all over the map right now in terms of both excitement and negativity. Here’s how he announced the news on Twitter. So odd writing a film before the previous one hasn't come out. #TheVisit comes out in Sept, and I'm 75pgs into a new small scary thriller. 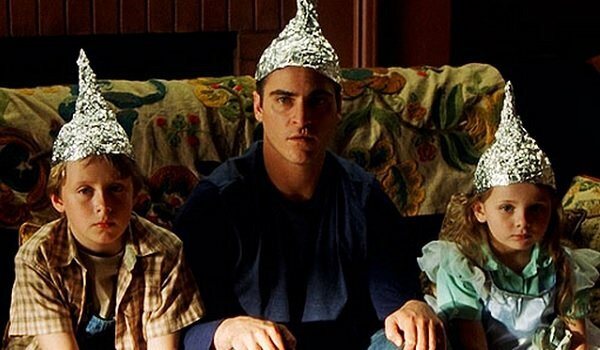 I like the idea of Shyamalan making smaller movies again. Everything looks smaller than After Earth, really. I have no idea what to expect from The Visit, which will center on a brother and sister who discover their grandparents are mixed up in something disturbing, so there are even less expectations to be had for another "scary thriller." He does go on to say in another Tweet that he’s wondering if people will enjoy the comedy in The Visit, and whether he should have more or less of the same in the new feature, saying, "Already I’m screwed." Not the best thing to admit, probably. The Visit comes out on September 11th, at which point Shyamalan may have already filmed this movie on the down low. Are you guys ready for more from the Sixth Sense filmmaker? Kevin Smith, who already has a Krampus-related horror anthology in the works, has signed on to direct a segment for the Distant Corners Entertainment and XYZ Films project Holidays, which will focus on a variety of different holidays celebrated around the world. So it’s not just Christmas and Halloween this go around, and each segment will revolve around a different day. Check out the poster for the film, which hit the market at EFM. There are several other quality filmmakers involved with Holidays. There’s Dark Skies and Legion director Scott Stewart, The Pact and At the Devil’s Door director Nicholas McCarthy, the Starry Eyes team of Dennis Widmyer and Kevin Kolsch, The Midnight Swim’s Sarah Adina Smith, and Anthony Scott Burns, whose short Manifold and Darknet episode are both quite excellent. 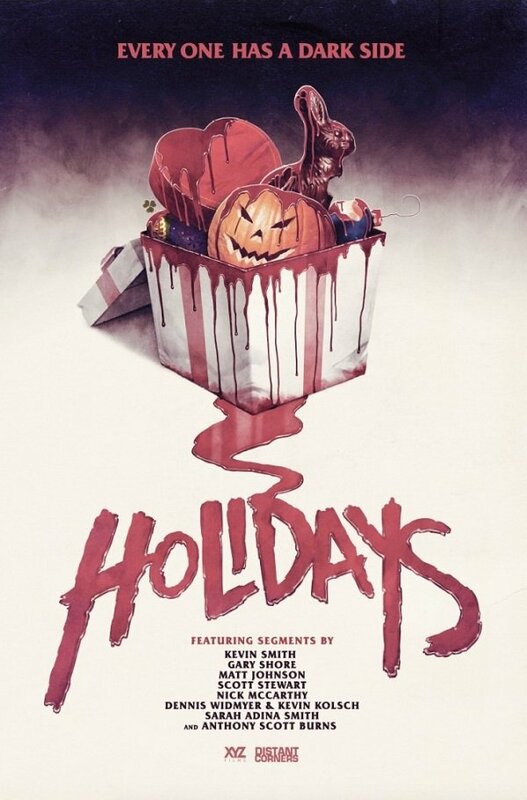 I love a good horror anthology, and Holiday has an excellent set of filmmakers involved. What could go wrong? If you haven’t seen Pascal Laugier’s 2008 thriller Martyrs, then you have saved yourself one of the more visually brutal experiences associated with the horror genre. (But you should still watch it, because it’s a well-crafted trip through a bleak hell.) The planned American remake is apparently still a thing that exists, and it now has a pair of directors in Kevin and Michael Goetz, whose first film was 2013’s enjoyable psychological thriller Scenic Route. And not only does it have someone now guiding it to a release, but Martyrs also has one of the most boastful sales posters I’ve ever seen. The Ultimate Horror Movie? Really? I don’t think the original was ultimate in too many ways, beyond the how it provoked revulsion. The original follows a 25-year-old woman as she aims to get revenge on the family who kept her captive when she was a young girl. Jason Blum’s Blumhouse Productions is behind this one, along with Conjuring producer The Safran Company. Blumhouse movies tend to rely more on jump scares than all-out sense-hammering horror, but it would be impossible to tell this story without some intense visual imagery. I’ve got nothing against the Goetz brothers, though, so here’s hoping they deliver something that feels like its own project. Of all the video games out there that are ripe for film adaptations, the PC/TurboGrafx-16 adventure game It Came From the Desert getting set up for the big screen is as unpredictable a thing as there ever was. And seriously, that’s the only kind of screen that this movie could work on, because GIANT ANTS! As you can tell from the film’s pre-production teaser trailer seen above, this is going to be a creature feature with its weird mutated tongue planted firmly in cheek. The ant steps on, and then jumps over, the name of the movie! I can’t be alone in thinking this will be amazing. Check out the first poster, which Raven Banner Entertainment is using to sell the film at this year’s EFM. 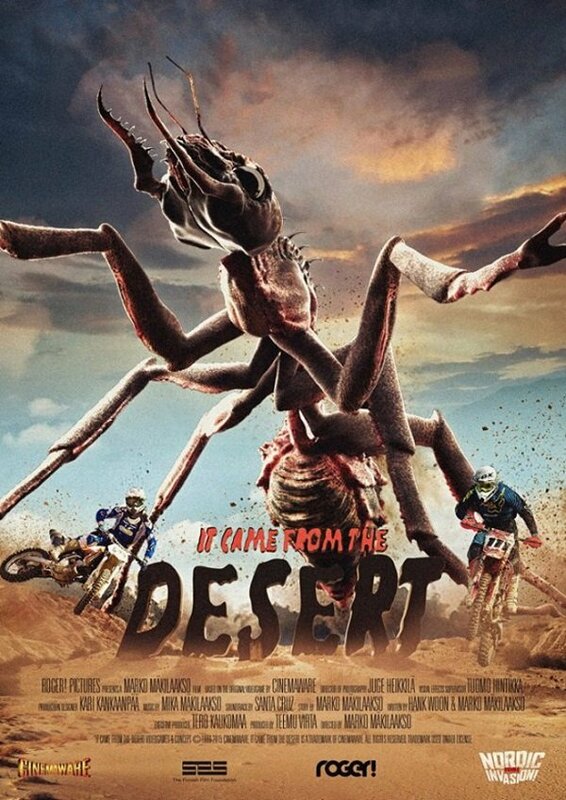 Though the official synopsis basically just says that giant mutant ants will be terrorizing a New Mexico desert, we know that dirt bikes are probably also involved. Which means we will almost certainly see someone riding a dirt bike across a giant ant’s back, and then my life will be complete. Roger! Pictures and game developer Cinemaware are teaming up for It Came From the Desert, which will be directed by Finnish director Marko Mäkilaakso (War of the Dead), who co-wrote it with Atlantic Rim scribe Hank Woon Jr. The game, which came out in 1989, involved a lot of driving around, talking and learning about the situation, which went along with actually stopping the ants from attacking. The film, which is aiming to shoot this fall for release in 2016, will take place decades after the events of the game, with new characters finding new horrors to battle. I’m all over this one. 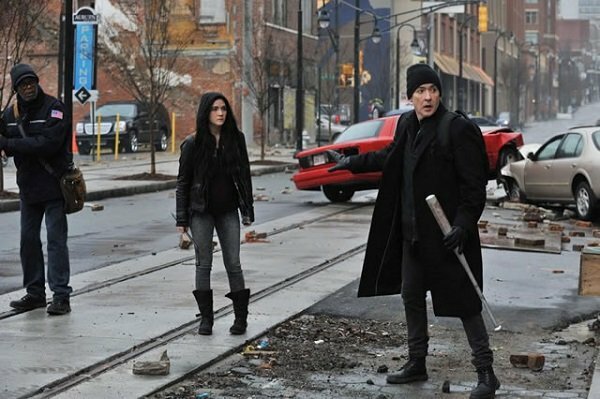 I have a lot of blind-to-contrast anticipation for the upcoming adaptation of Stephen King’s 2006 thriller Cell, a book that I loved despite its obvious problems. The first sequence in particular, during which the world goes violently insane due to an electronic pulse heard over cell phones, is one that I cannot wait to see on the big screen, and it looks like that might be where our very first look at the film was taken from. Cars have crashed and John Cusack is on high alert. Things will get much worse than this as the story goes on, though. Cusack plays Clay Riddell, a New Englander who leads a group of survivors on a long trek as he tries to find his son in a world full of loonies. Some of those survivors include Samuel L. Jackson and Isabelle Fuhrman, seen in the picture, along with Stacy Keach and Miko Hughes. King wrote the first draft of the script, which was touched up by Last House on the Left writer Adam Alleca, and the film will be directed by Paranormal Activity 2 director Tod Williams. It’s going to take an amazing trailer to get people invested in this one before its release later this year.